1890 NP well located next to the much much newer sewer ponds on the south side of Coulee City. In the little dip below the slanted name "Pinto Ridge Road NE" between the dark and light green ponds. Note that this well is only 7 feet deep! "U&I awarded the $7 million construction contract to J. W. Hardison of Yakima. A secondary contract was awarded to A. A. Durand and Son of Walla Walla to drill a well. U&I built several homes in Moses Lake for key personnel. The Northern Pacific railroad built a spur to the plant from its Wheeler siding. The Milwaukee Railroad also extended a spur line to the plant. Paul Scalley was appointed the local manager of U&I." The NP named its location at U&I “Scalley.” In the NP list of Officers, Agents, and Stations, Scalley was located at Wheeler, with no other differentiations. There is about 1 mile difference, as the crow flies, between Wheeler and Scalley. The Milwaukee Road built its spur from its station at Seiler on the Moses Lake branch. What is interesting to note is that today the physical location of Scalley, at the long abandoned U&I Sugar plant, is the connection between what is left of the old NP Connell Northern branch (from Connell to Wheeler, and abandoned from Wheeler to Adrian), and the remnant of the Milwaukee Moses Lake branch. The Milwaukee is gone between Warden and Seiler, and is connected to the outside world via Scalley and the NP connection. All is now operated by the CBRW. This image from 1940 looks northward towards Steamboat Rock. You can make out the railroad right-of-way crossing the lake, also seen here. You can make out the old highway to the right of the railroad. The current highway, SR155, is a lot closer to the cliffs on the right, and then cuts through the basalt cliff just to the right of the same lake the railroad crosses. This section of highway is locally called the "Million Dollar Mile" as that is about what is cost for this section of highway to be built before this whole area was flooded to become the Equalizing Reservoir now called Banks Lake. On a steep rocky cliff some 400 feet above the stretch of dark green, which is the Columbia River, a steam shovel can be seen daily throwing down big boulders over the edge of the precipice. The machine is part of the equipment used by Crick & Kuney on the project of building the joint highway and rail entrance from the mouth of the coulee to the dam site. The big dynamite blast of 18,000 pounds was set off last weekend, but because of the excitement caused by the president’s visit here on Saturday it practically aroused no excitement here. In February of 1929, Grant County entered its third decade with a sense of defeat. Discouragement over the failing economy, the weariness from the efforts expended during World War I, the devastation of the drought that drove settlers from the searing desert, and the decline of the railroads from their former state of glory all contributed to the darkening hope of carving out a worthwhile living from the Columbia Basin. Changes were evident everywhere. Farms were now federally subsidized, but there were fewer of them and more restrictions and loopholes made the money harder to obtain. Dust still rolled across the sagebrush fields, making the Basin nearly uninhabitable. Business was still slow; Grant County was in all practicality a frontier town when it came to the latest in modern advances. The stock market was showing signs of collapse, and though most local people had little to do with such things, the shock waves rippled across the country to this meager corner of the world. Banks, schools, rural post offices, businesses and farms began to fail, close and disappear. Railroads were no longer the primary mode of transportation for either freight or personal travel. The government had extensive control over rail traffic through the Interstate Commerce Commission, which began to have a negative effect on growth in the industry. The last major rail construction project was completed in 1931, connecting Klamath Falls, Oregon, 203 miles to Keddie, California, along the Great Northern/Western Pacific line. No one believed it was a profitable venture anymore. Locally, there was very little rail activity other than the day-to-day movement of goods, mostly, from one regional center to the next. Larger operations, once successful in a thriving industry, now downgraded or recycled instead of rebuilding. The depot at Trinidad burned down in 1931, to be replaced by the original 1892 structure from Rock Island. The Krupp depot was retired and sold in 1936, and replaced a year later with a small, 16’x24’ shelter/shed-style depot. The Great Northern line changed its endpoints for railway post office service, but the only local indication of that was the new town name on the postage cancellation stamp appearing on mail delivered to Grant County. Rumors and outlandish ideas began to swirl around the region back in the first decade of the county’s history about bringing irrigation waters to the dry, desert plateau. A quiet move by the county commissioners to investigate these ideas was leaked to the press in 1918, fueling a heated debate spreading from Wenatchee to Spokane. Finally, in the midst of a deepening recession and faltering hope came a reason for Basin settlers to rejoice: a large dam for irrigation was to be built at the northern end of the Grand Coulee, bringing jobs, business and growth in every area of Grant County. Two opposing parties eventually emerged, one supporting the irrigation dam at the Grand Coulee site, the other proposing a gravity-fed canal system stemming from the Pond Oreille River. 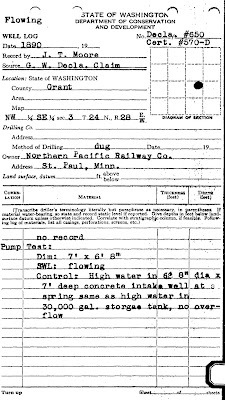 Besides the study initiated by the Grant County Commissioners, the Northern Pacific (NP) conducted a railroad line survey up through the floor of the Grand Coulee to determine the most feasible route from Coulee City to the proposed Grand Coulee dam site, and the Army Corps of Engineers began a three-year survey of the comparative feasibility of the two debated irrigation systems. Major John Butler of the Corps finished first, and published his findings in favor of the Grand Coulee option, sometime in the year after Black Thursday, 1929. President Herbert Hoover disagreed, arguing that the cost was too high and that it would only make worse the surplus of farms after the war. This all changed as the next presidential election loomed large in the fall of 1931. Franklin Delano Roosevelt made a campaign promise to build the country’s “next great hydro-electric development” at Grand Coulee. His devotion to the new Keynesian economics of the time included a belief that large projects such as the Grand Coulee Dam would create large federal expenditures and thus promote economic growth. Under this dramatic attitude change, he immediately included the dam project in his Public Works Administration program upon his election. Nationally, one in four workers seeking jobs was unable to find employment, despite the fact that the first recessionary period of the Great Depression had ended in March of 1933. FDR wasn’t convinced yet that the country was out of the woods. He called a bank holiday in March for one week to save money, and when he met with the supporters of the Grand Coulee Dam the next month, he pressured them to construct a smaller dam that could be expanded upon later, in hopes of reducing the $400 million price tag of the high dam option. Reluctantly going ahead with his plan, the Bureau of Reclamation began signing contracts with both the state and contractors, leading to the groundbreaking ceremony for the new “low dam” on July 16, 1933. In September, the NP finished their survey of the Grand Coulee for the purpose of constructing a railroad line from Coulee City’s Odair junction to the dam site 28.5 miles to the north. Two months later, they posted a public notice petitioning the ICC to build the line. Two problems arose. First, the NP was a land-grant railroad, and under its contract with the federal government, the cost of freight shipped along its line for government purposes was subject to a 50% price reduction; this would have cost the company $1.5 million in revenues. Also, trucking companies insisted that the government open the project to bids, rather than rely solely on rail service as they had intended. The NP had also made three stipulations in its petition to the ICC. It stated that it would not build the line if it could not be proven that the dam would be built, which the ICC held as a foregone conclusion. The second demanded all the rail commerce business generated by the dam; in this case, they were told it was their responsibility to obtain such business by their own effort. Lastly, the NP wanted prior permission to abandon the line upon completion of the dam. The ICC understood that the current construction was for a low dam with the option of increasing the height to 375’ at a later date; the line would be necessary in the near future if this remained the plan, and so the NP would be required to apply for that option when this was decided. In its decisions, the ICC also referenced the recent onset of construction at Boulder Dam at Colorado, stating that rail service contracts had been established before work began and so it would be here. The estimate for the construction of the rail line was $750,000, and the media implied that the speed at which Boulder’s dam was built was to be met here as well. The Interior Department and the Bureau of Reclamation discussed early on whether the main contractor for the dam would also build the line, but ultimately decided that the rail project would be government-funded. The contractor would be responsible to provide and fund any items to be taken away from the site at the completion of the dam; the government would purchase the rest. This was due to concerns over whether a contractor could procure the funding in a reasonable timeframe to complete the project in the short window proposed. This intention, of course, did not remain the case. On the day that bids for the rail project were accepted on May 18, 1934, it was discovered that the NP had miscalculated the estimate of the amount of rock tonnage to be removed along the proposed right-of-way. The twelve bidders endured a half-day postponement while their bids were reevaluated under the new estimate. Out of these firms mostly from Seattle or Spokane, only one had an office relatively near the site. David H. Ryan, a California contractor with an office in Almira, won the right to use the NP survey to build the government railroad from Odair, the NP siding at Coulee City, to the head of the Grand Coulee. Ryan had won the bid for the excavation of the foundation of the dam, but had experienced serious conflicts over his contract; it took three months to complete federal investigations and approve the contract for the construction of the railroad. James Crick and Max J. Kuney of Spokane won the bid on June 18, 1934, to construct the portion of the MWAK company line from just east of the dam site down the hillside to the excavation site. 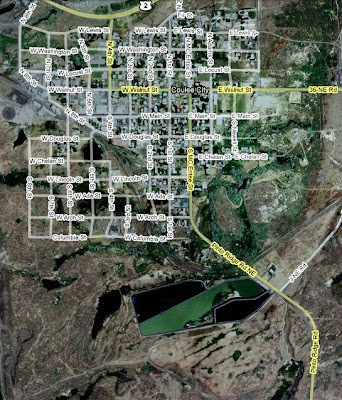 This included a highway as well, and paving of the engineers’ model townsite as well; this townsite is now the west half of the city of Coulee Dam. Soon Grant County was buzzing with preparations for a planned visit to the dam site by President Roosevelt, and the railroad was to be his primary means of reaching the remote location in the northern Columbia Basin. Originally, FDR was to travel by train to Soap Lake, and then be carried to Grand Coulee by a limousine from the Seattle Police Department. What the article did not report was the cause for the concern. Few people in the country knew that our president was handicapped. Had the train stopped in Soap Lake at the proper location for FDR’s wheelchair to be lowered onto the small platform, the other passengers would have been left to step onto gravel and sagebrush far from the depot. The Ephrata platform extended the entire length of the train, and would not cause undue notice of the president’s condition. Five days later, the official train reached Spokane from Portland and Bonneville at 1 a.m., where large crowds were expected to greet him despite the early hour and predicted rainshowers. Once the train was moved to the Great Northern line, it was to travel directly to Ephrata, where more large crowds were to await a glimpse of the president. At nine in the morning, FDR left his train for the limousine. According to the Chronicle, he viewed “a display of mid-Columbia products” (“Columbia Basin irrigated farm products’, as in said in an earlier release) (Spokesman called it a “Grange exhibit”, and said he visited ML too) before leaving town. The party took the North Central Highway (part of today’s Highway 28) five miles to Soap Lake, then up over High Hill Road and Pinto Ridge to Coulee City. All told, it was a journey of 55 miles over what was then called a comfortable ride over “oiled roads.” While on this journey, all roads leading to the dam site were closed to general travel, ostensibly for security purposes. At the site of the dam, FDR inspected the dam site with Bureau officials, then spoke shortly after noon to an audience of roughly 20,000 at the “Green Bowl,” a natural amphitheater conveniently located beside the construction site. While he was away, his train was backed up all the way to the last vestiges of the roundhouse at Wilson Creek, where it was turned around and again backed down the track to Soap Lake. The president boarded there and whisked away to arrive back in Spokane by 6 p.m. Originally, officials had expected much more work to be completed by the president’s visit than FDR actually witnessed. The roughly 200-foot-long tunnel through the admittedly hard granite was still not completed in May of the next year, according to the Chronicle; experienced drillers claimed that the constant need to resharpen their tools caused very slow progress, worse than they had ever faced. After completing the drilling process, the tunnel was abandoned altogether. This happened because the rail bridge farther down the grade, on which general traffic flowed through October of 1935, was never used for rail traffic; by the time repairs had been made due to several slides and slippages damaging the structure, there was little need for rail service to the east side of the river. Officials stated the bridge would not be capable of sustaining the weight of the tracks and the loads carried on them. The steel rails for the project weren’t laid according to plan, either. The first rail was laid in September of 1934, and didn’t reach Grand Coulee until December, finally bringing the company and government roads together, an accomplishment worthy of celebration. Dignitaries came from across the country to drive in the “golden spike” commemorating the joining of Ryan’s supply line to Crick and Kuneys’ construction spur. On Saturday, December 8, 1934, Governor Clarence Martin, United Stated Senator C. C. Dill, Contractor David Ryan, Cheney Cowles of the Spokane Chronicle, and others gathered at Grand Coulee Center. After a large crane dropped the last piece of rail into place, the dignitaries tapped the golden spike into place. Behind these men stood the “Queen of the Columbia,” Miss Lou Turner of Harrington. As the Spokane Chronicle reported it earlier that fall, “The most beautiful of all the girls of the Columbia basin area will be chosen to preside over the driving of the golden spike in the new government railway, leading from Coulee City to the dam site. The Chronicle, at the request of the Coulee dam post of the American legion, will undertake to find the queen of youth and beauty and to crown her on the day of the completion of the railroad.” One of Miss Turner’s other official honors was to pull the throttle on the old logging locomotive – a favorite of Mr. Ryan – which would soon run up and down the hillside beside the dam site. Mr. Ryan was also crowned “King of the Rails,” and the day’s events included a reception for the two royalty, speeches, a banquet, and a dance hosted by the American Legion. At last closing out a busy 1934, MWAK announced on December 20 that the new government railroad would not offer passenger service to and from the dam, dispelling rampant rumors to the contrary. In 1935, construction of the railroad continued. Despite the golden spike ceremony, ties still lay beside the tracks and ballast hadn’t been placed; Governor Martin had commented on this, saying he intended to return “when the railroad looks more like a railroad,” according to the Chronicle. A portion of the railroad was relocated in the spring because of continued sliding in the area; rail was expected to finally be laid by early May, allowing the first locomotive to pass along the line by the end of June. Again, all estimates failed, and rail service didn’t begin until July. On the 27th, Governor Clarence Martin acted as engineer for the special train from Grand Coulee to Coulee City, christening the new line at long last. In April of 1935, the Supreme Court ruled against FDR’s administration, saying that the construction of Parker Dam in Arizona and others like it had been built without the required authorization of Congress. The president began to push legislation which would finally give legitimacy to the more than twenty dams already under construction around the country that had been initiated by his administration. After a large controversy over the unfathomable Grand Coulee Dam project, Congress forwarded the amended Rivers and Harbors Bill to the president, who signed it into law on August 30, 1935. Meanwhile, the month of June saw the order from the Secretary of the Interior to construct the base for the high dam, instead of the in-progress low one. With excitement building over the okay to construct the dam originally chosen by Grant County pioneers, materials began to pour into Grand Coulee. November 1, 1935 brought the first delivery of cement by rail up the Grand Coulee. Five cars came from the Lehigh Portland Cement Company’s Metaline Falls plant, and three from other companies on the coast. It was stored in large silos at the west end of the construction site until it could be mixed in the concrete mix plants at the time of pouring into forms. Each of these silos held 40,000 barrels or 160 carloads of 250 barrels each, according to the Chronicle. As the demand for cement picked up, the intention was to run two cement trains to the dam site a day; each week, approximately six cars came from Metaline Falls, three from the Irvin plant of Spokane Portland Cement, and 30 from the west coast plants. Governor Martin again visited the site on December 6, 1935 – another of many visits he would make to the largest project occurring in his jurisdiction. He made the first official concrete pour of four cubic-yards; though over a week earlier, on Thanksgiving, officials had poured nearly 400 times that amount as a test pour. Rail was used in multiple areas beyond the supply line from Odair. The construction trestles included the many tracks used by small steam locomotives which shuffled the large vats of concrete between the plants and the pour locations. The switchbacks descending the hill to the base of the dam, which outlasted the tunnel and bridge counterparts, were used, as well as a skip system, to bring rail cars down to the level of construction. For the next several years, not much changed in day-to-day rail operations. A typical locomotive ran daily trips between Odair and Grand Coulee, where it met with the steam-powered logging engine. This Shay locomotive backed down a two-mile, 5% grade, at eight to ten miles per hour, carrying 25 cement cars, each of which held 72,000 pounds of cement. An official MWAK newsletter in May of 1936 stated that, in 21 months of construction at the Grand Coulee Dam, the railroad had only been in operation eight months, and yet had carried 55% of the total tonnage of supplies for the project. During the remaining three years of this decade of Grant County’s history, concrete pours were halted by freezes, landslides, and water cresting over the concrete forms and coffer dams. Once construction resumed, several records for the amount of concrete placed were achieved each summer. In the middle of the second recession of the Great Depression, the contract for the second phase of dam construction was awarded on January 28, 1938, to Interior Construction, soon to be renamed Consolidated Builders Inc. (CBI) to avoid confusion with the Department of the Interior. CBI’s first projects, accomplished in the spring on 1938, were to move the west concrete plant to join with the east plant, to build a new railroad bridge, and to replace the lower MWAK construction trestle with a new, higher trestle to facilitate the construction of the taller dam. In relation to the current traffic bridge below the dam, the MWAK rail bridge was to the north, and on a more level plane; it was roughly half a mile to the north of the dam. The location of the two construction trestles in question is now ensconced within the perimeter of the dam; MWAK’s was lower, CBI’s was higher and more southerly. Unfortunately, CBI put off hiring back the majority of workers until the end of the year, causing economic hardship to many workers and their families who had moved to the area; the average worker earned only $0.80 an hour, and in dangerous conditions. On the other hand, railroad workers – when cement was in demand and concrete was being poured – were paid fairly well. Brakemen and firemen were paid $0.90 an hour, conductors one dollar, and locomotive engineers $1.35 an hour; these men would have still had jobs when concrete works shut down because they brought in many different supplies used in construction. The Grand Coulee Dam project had brought a level of prosperity back to the Basin. A gas station owner in Coulee City was reported as saying that he saw business jump to a point where he was making more profit in a month than he previously had in a year. Thousands of men who couldn’t find jobs elsewhere in the country rode the rails to reach this barren desert, hoping to work on the massive dam and its railroad. The next decade saw not only a continuation of these hopes, but the completion of the dam, the second world war, and the beginning of the long-awaited irrigation project that would breathe new life into Grant County and the Columbia Basin.